Julian Goglia’s Goonies Never Say Die! Get the full store HERE—–> (that means click) AND MORE in Creative Loafing‘s Cocktail Issue. Cold rain outside, dark gray skies, I needed something warm and rich and mellow to ease me into a good night. And I thought of this cocktail recipe from Greg Best called Rhythm and Soul, a drink that’s as smooth as Otis Redding, as rapturous as Al Green, as… OK, I hate the forced metaphors, too… it’s just a damn great cocktail. He calls it halfway between a Sazerac and a Manhattan, which captures the taste pretty well. 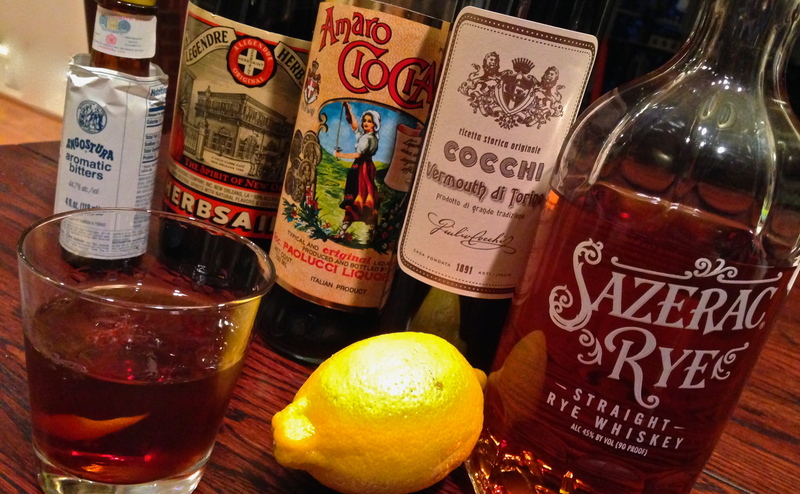 Best’s version calls for French absinthe, rye whiskey, Averna, and Carpano Antica. My retread this night went with Herbsaint instead of the absinthe, Sazerac rye, Amaro CioCiaro instead of the Averna, and Coccchi Vermouth di Torino instead of the Carpano Antica. It’s amazing either way. 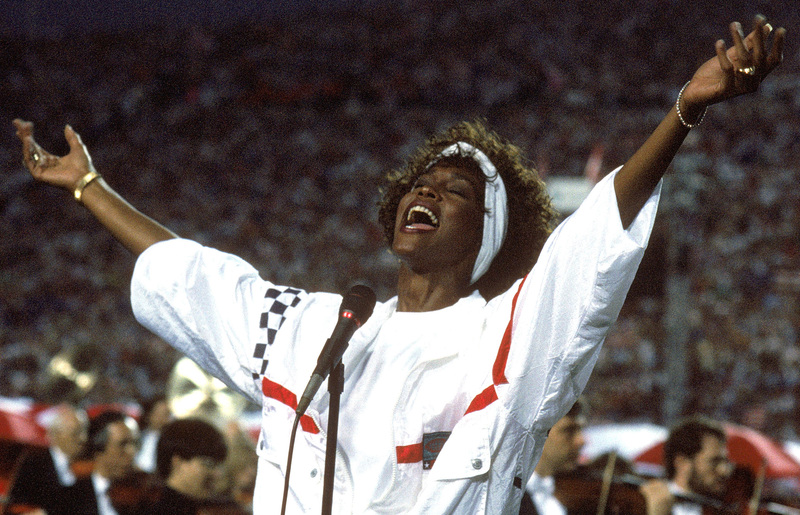 First you get the anise/fennel punch in the nose, then a rich, deep, cinnamon and clove whiskey base note, then a bright herbal high note that goes on and on like Whitney Houston digging in hard on the national anthem. It’s rich, complex, multi-layered, all those things that make you sit back and just say… damn that’s good. Like Booker T & the MGs laying down Green Onion, with Al Green and Otis Redding clapping time and crooning along in the background. Whitney’s just taking it in, smiling and nodding. That’s some rhythm and soul. 1. Fill a rocks glass with crushed ice. Let it chill for a bit, then pour in the Herbsaint and roll around to fully coat. 2. In a separate mixing glass with ice cubes, stir the rye, amaro, vermouth, and bitters to mix and chill. Discard Herbsaint and ice from rocks glass, then strain the mixing glass contents into the chilled rocks glass. Twist the lemon peel over the drink to release the lemon oil. Discard lemon peel and enjoy, or toss it in the glass if you’re feeling it. Since today is Halloween, I thought I’d bring back from the (almost) dead a cocktail I first tried at Leon’s Full Service in Decatur, GA, a few years back. At the time, Miles Macquarrie shared the recipe, and we did a quick little video showing off Leon’s bar and the making of the drink itself. 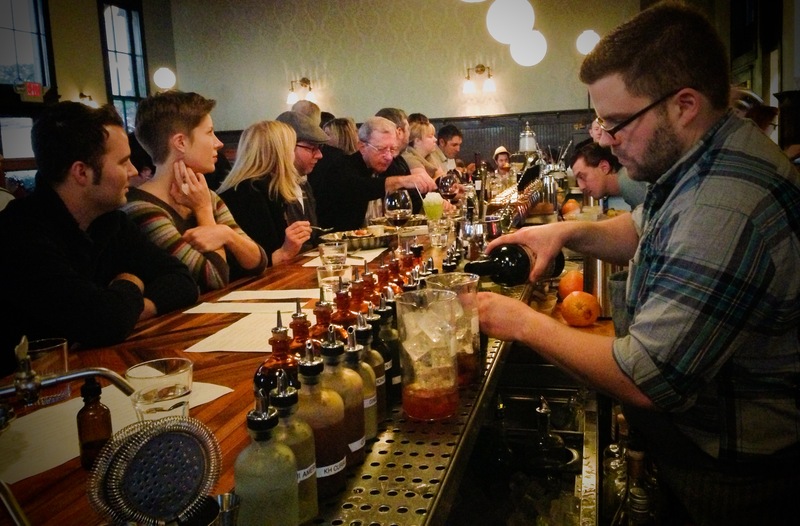 Miles is now slinging excellent drinks at sister restaurant Kimball House (go. now. for oyster happy hour 5-7pm. and great cocktails. really. ), but brought back this drink for Fall. It’s great for easing into the cooler weather, a mix of house-made apple-cardamom syrup, gin, Liquore Strega (Italian for witch), a bit of lemon, and an absinthe rinse. Full recipe below. Leon’s Full Service: Miles & the Witch Hunt from Thirsty South on Vimeo. Rinse cocktail glass with absinthe, combine all other liquid ingredients in cocktail shaker, shake vigorously with ice, strain into cocktail glass. Squeeze orange peel into glass and drop in! Combine 1 cup water, 2 cups granulated sugar, and 1/4 cup cracked green cardamom pods in saucepan. Simmer over Med-High for 5 minutes, until very fragrant. Add 3 cups fresh pressed apple juice, simmer until reduced in half (roughly 15 to 20 minutes). Strain, cool, add a dash of neutral spirit as preservative, may be refrigerated up to 2 weeks. Coffee, Fernet Branca, Rum: Whynatte? 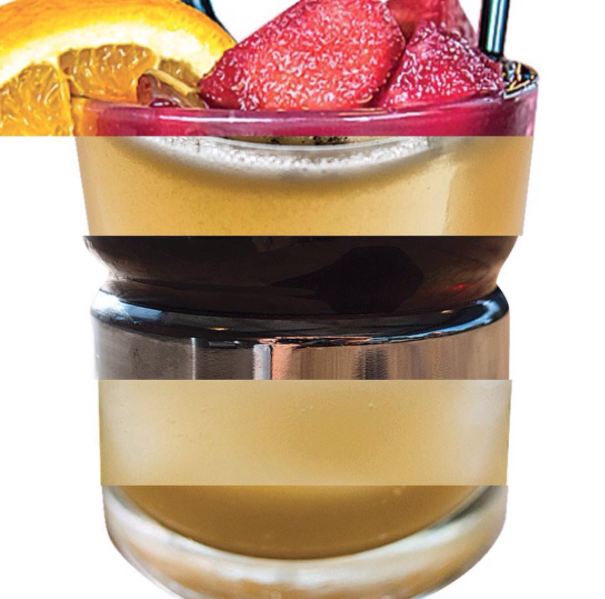 Why the hell would anyone want to mix a latte energy drink, Fernet-Branca, and ginger-honey infused rum? The answer lies somewhere at the center of the Venn diagram where hipster bartenders, tweaked-out party twenty somethings, and laid-back Dominicanos converge. And if you read that and think there’s no way that Venn diagram actually exists in the real world, well… you might be right. But I’m hopeful that somewhere down a dark alley not far from the beach in Punta Cana, there’s a mustachioed mixologist with a PDT Cocktail Book on the shelf, a fridge full of Whynatte, an old uncle home-infusing ginger-honey rum, and a raging dance floor nearby. It could happen, right? In any case, Jesse and I were talking about how Whynatte just doesn’t fit behind certain bars, and I asked if anyone had paired it with something super-bartender-nerdy like… Fernet-Branca. After all, Fernet fits somewhere on the same branch of the spirits tree as Jägermeister – embraced both for its purported medicinal qualities and definitive medicinal taste. The key difference for Fernet-Branca is that it dials way back on the sugary syrup of Jägermeister. Altman said they had once tried a push to get some serious bartenders to get creative with Whynatte, but it was the simple shooters that really seemed to click best. After our chat, I just couldn’t let go of this seemingly incongruous pairing – between the whipped cream vodka loving party animal and the hipster bar geek. I did a bit of digging around for other similar drinks, which mainly reinforced that Fernet-Branca and (hot) coffee or espresso are frequent companions. So maybe this pairing wasn’t so crazy after all. I tried simple first – just two ingredients – and landed on 2oz Whynatte and 1oz Fernet-Branca over ice. It makes for a bracingly refreshing cold coffee drink. Then I tried adding in rye, figuring bourbon might be too sweet, and found a nice balance at 2oz Whynatte, 2oz rye, 1oz Fernet-Branca. You still get the herbal punch of the Fernet, the creamy coffee flavors still coat the tongue, and the rye somehow manages to bridge the two with a potent whiskey presence. Not bad. Doing some further digging, I came across a cocktail recipe that got me thinking that rum could be a good companion. I started rifling through my rum options for inspiration. An unaged rum proved too sharp. An older rum seemed a bit, well, wasted in such a concoction. A spiced rum proved too… much. And then I tried a bottle of Cayrum that I had been given not long ago. Cayrum, from the Kane Family Rum Company, also happens to be based in Atlanta, though the rum is distilled, aged (three years in bourbon barrels) and infused with local honey and ginger in the Dominican Republic. The ginger really pops in this stuff – it could almost replace a ginger liqueur like Domaine de Canton or the King’s Ginger in cocktail recipes. But it’s the honey (at least, I think it is) that helps bring the Cayrum into harmony with the latte and the Fernet-Branca when you mix those ingredients together. This is not a drink for everyone. Or maybe I should say, this is a drink for hardly anyone. There’s a 2 in 3 chance that you’ll find it disgusting. And a 0.9 in 3 chance that you’ll find it only mildly offensive. But I like this drink – it manages to be creamy, sweet, bitter, bracing, and spicy in some strange jumble of proportions. The ratio I settled on was 1 part Whynatte to 1 part Cayrum to 1/2 part Fernet-Branca. If you want something more coffee-like and less cocktail-ish, just amp up the Whynatte. If you find the medicinal slap of Fernet offensive, definitely dial back the Fernet-Branca. Me? I’m happy imagining my place at the bar by the beach, chatting with a mustachioed bartender while a nearby throng of partygoers dances the night away. Combine and stir over ice. If you like it frothy, shake it up first.